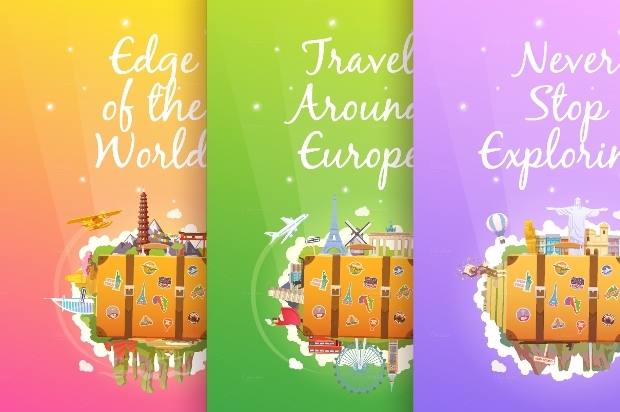 The travel and tourism is one of the fastest growing industries. Consequently, new businesses are constantly added to the competition. 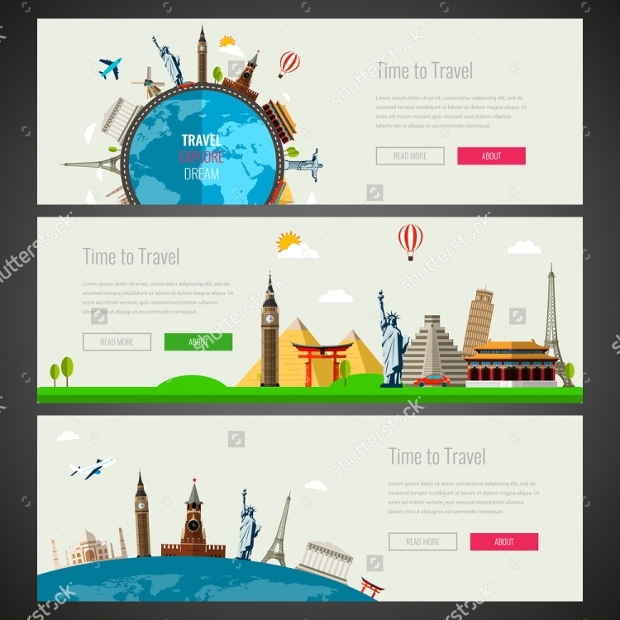 Whether you are looking to create a new website for a travel company or just come up with an exclusive banner about a travel campaign, here are some designs you can use. The work here is fresh and totally exclusive. Check them out if you don’t want to spend your time strategizing the design nuances. 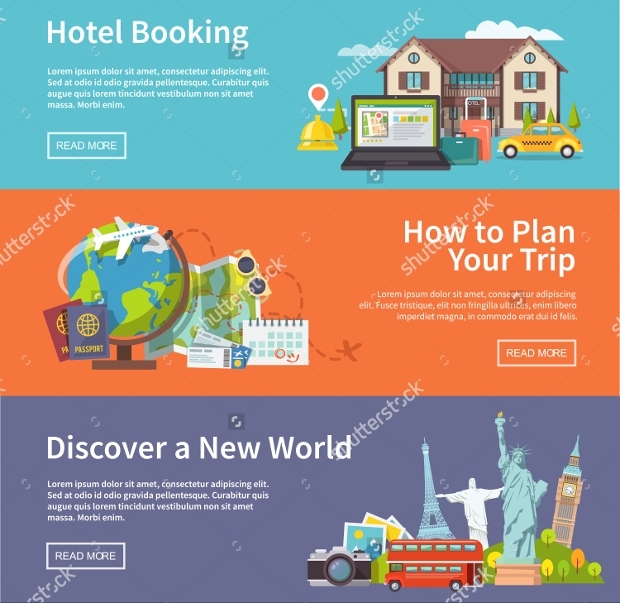 If you own a travel website, you would probably know how hard it becomes when it comes to designing materials for promotional web banners. Well, your troubles are answered here! 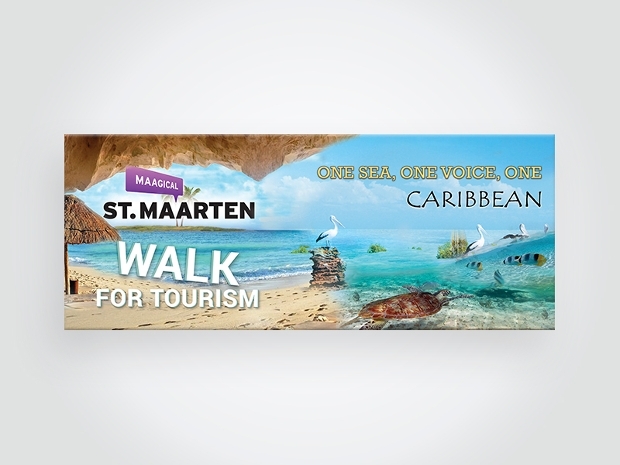 Featuring a representative image, the banner set offers advertisements in a variety of sizes and can be easily put into your website/Google ads with small customization. 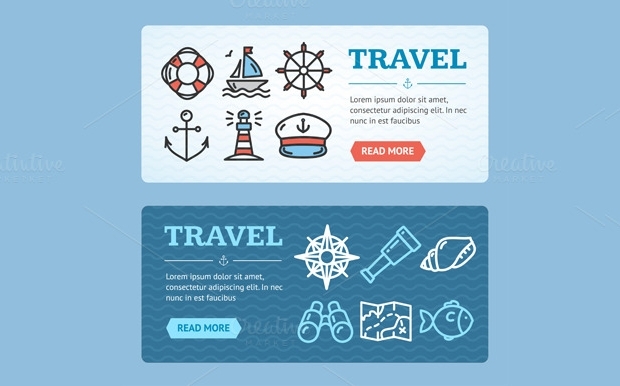 The web banner here come as interactive images and feature a unique illustration that will catch the attention of any user. 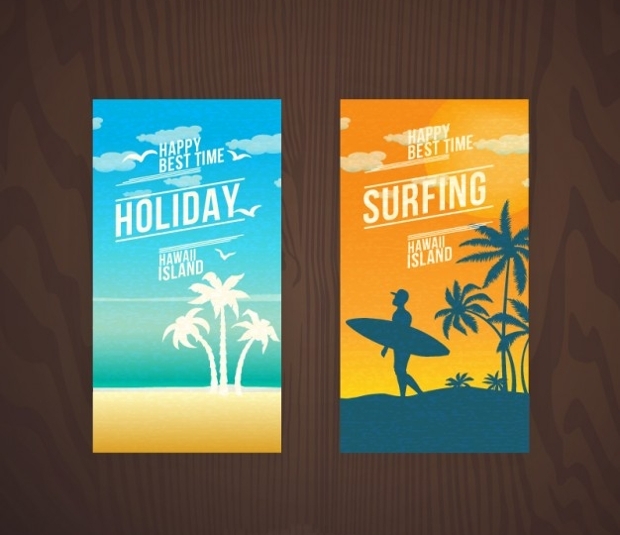 The theme of the banner here is seafaring but is available in two different color versions. 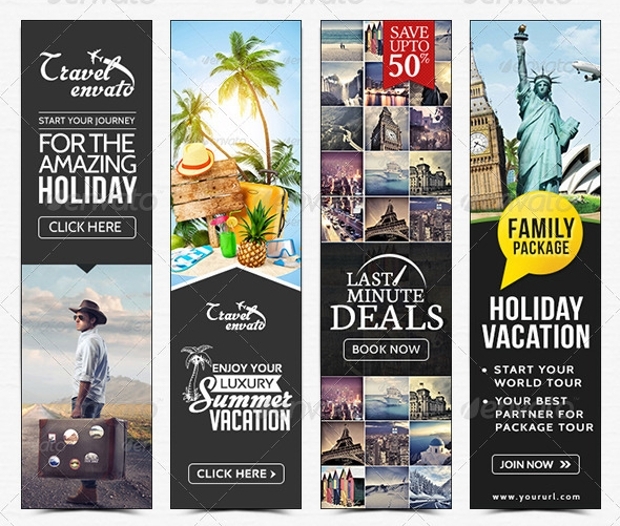 Another extensive bundle of web banners for travel companies, this would be the perfect and easiest way to spread your offers across the web. 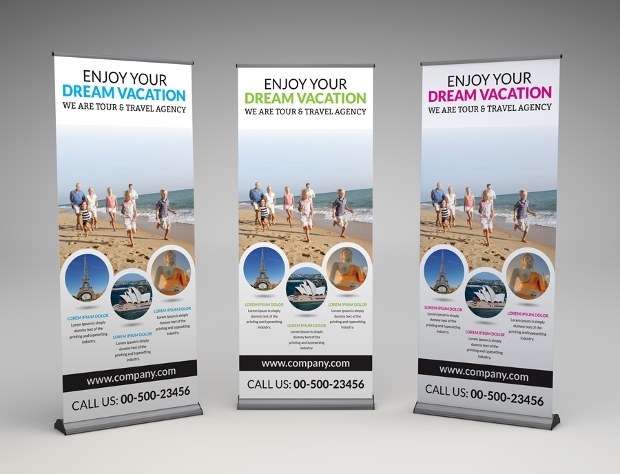 With 21 different banner sizes, you can hope to make your presence felt everywhere! Are you offering some amazing discounts for travel through Europe, Asia, Africa, Australia, North America and South America? 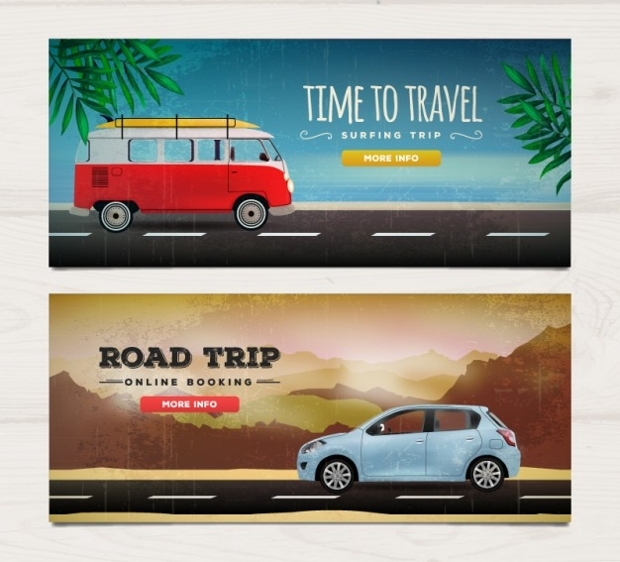 Well, let the world know about it by using these amazing looking web banners. 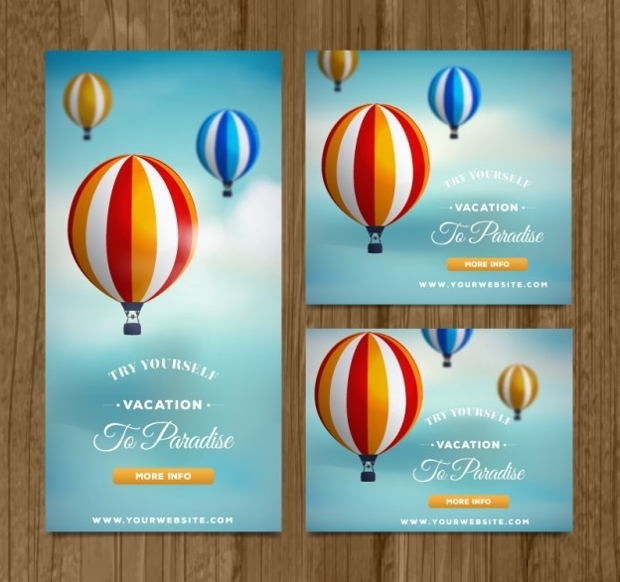 The banners come in vertical format and will be easy to integrate with any website you choose. Now, this would be the design to go for if you are attending a trade show, a conference or taking part in any such event. 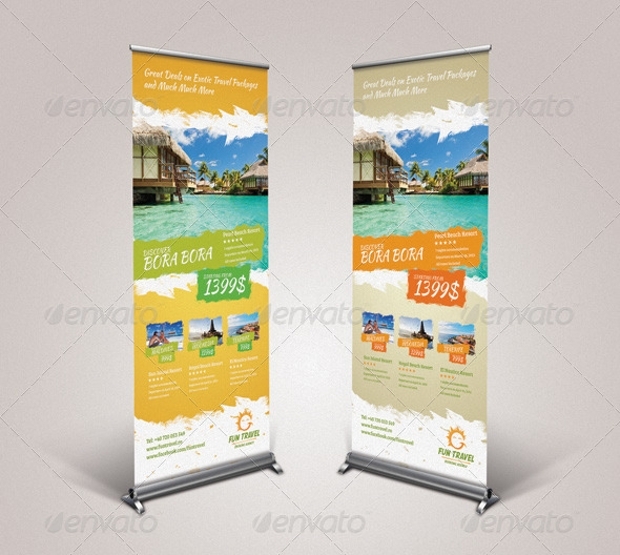 The roll up banner design is perfectly laid out to promote your products and packages. You may even make these a permanent installation in your agency office and booking counters. 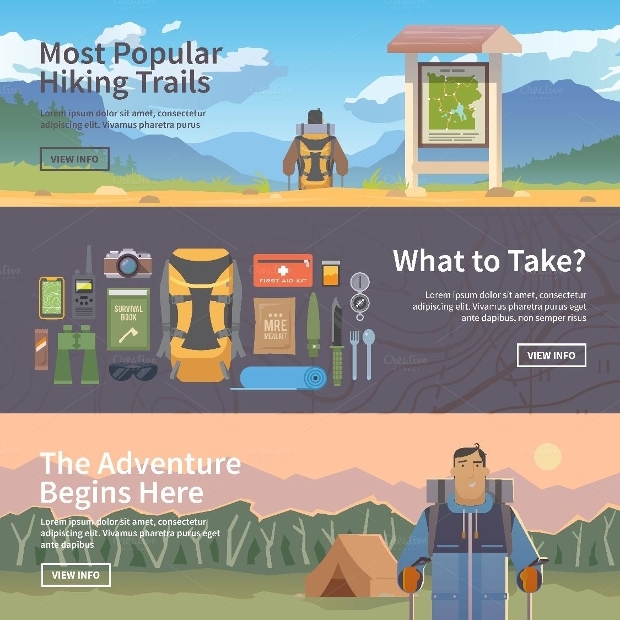 Do you cater to the demands of hikers? Be it a special product line you are trying to market or a tailored tour, this would be a web banner to go for. The banner features every tool to be used in climbing, hiking, trekking, outdoor recreation, sports, adventures and outdoor vacations. 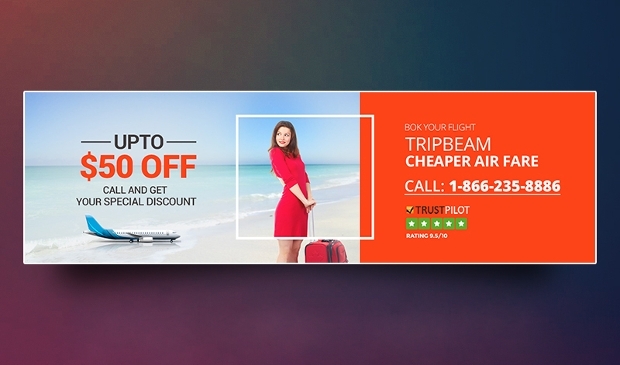 This would be a perfect web banner, web advertisement or even quality for a complete landing page on your website. 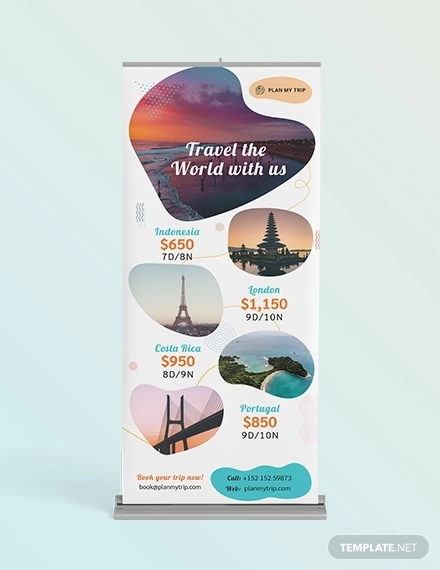 Each of the three rows in the banner speaks of different things on offer and you can choose to customize them according to your business. 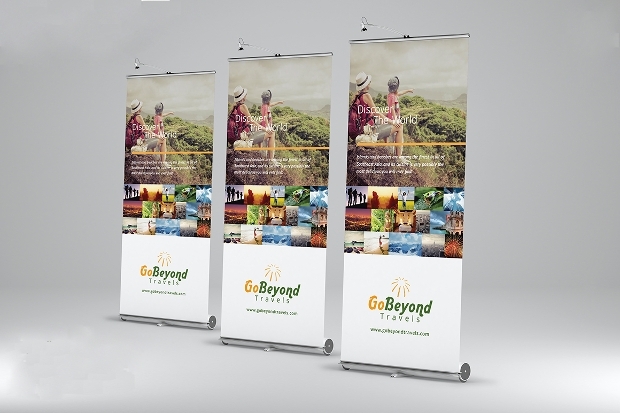 The look of this banner is colorful, fresh and should easily attract the attention of the visitor. Participating in a trade show and looking to make the most out of it? 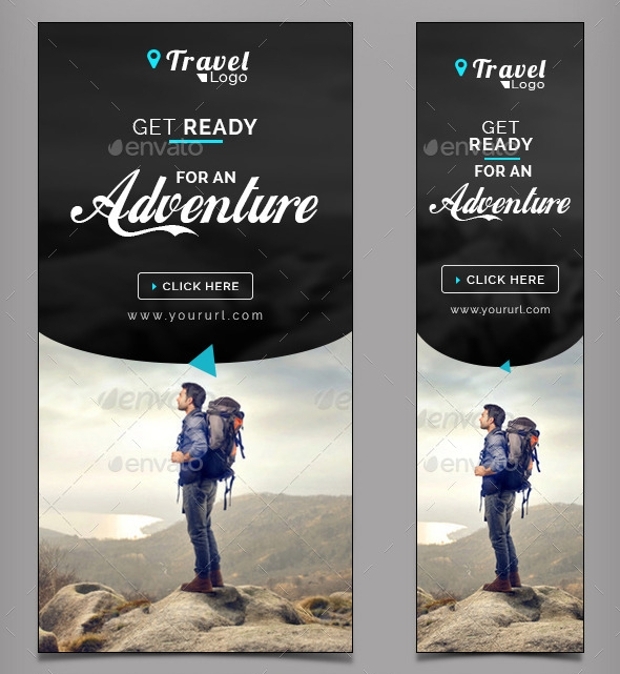 Well, here are some roll up banner designs that should specifically cater to your adventure and travel loving audience. Just put in the right text and your job is taken care of. 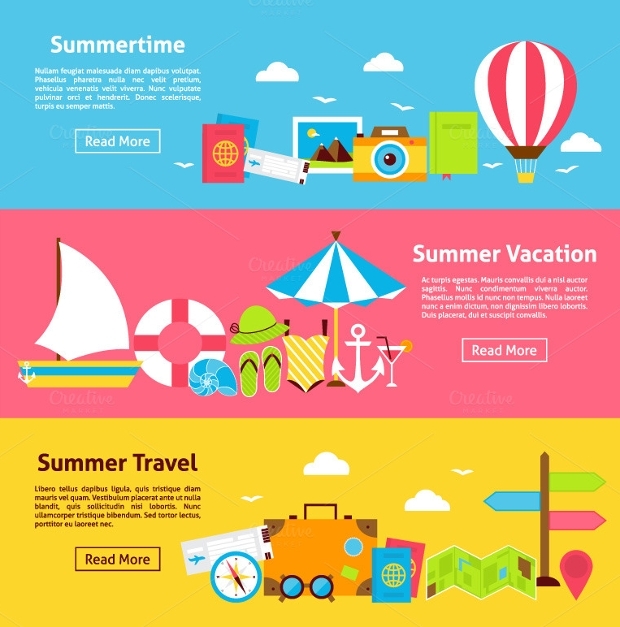 Advertisements are the most important tool for any online travel booking business. 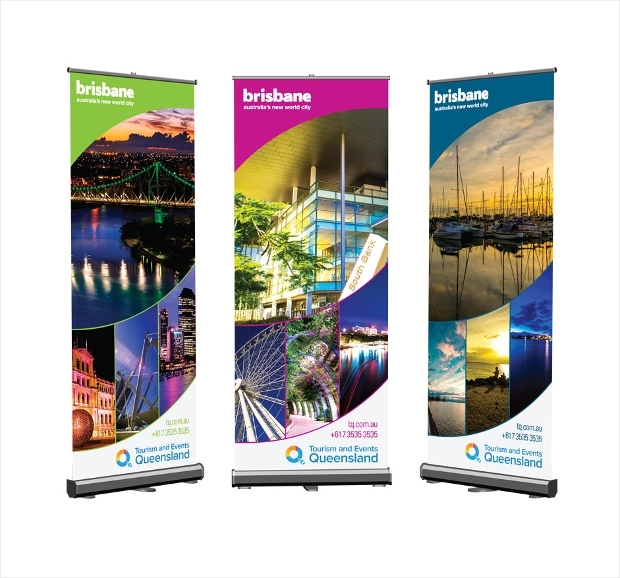 Well, to save your time and money here’s an ideal set of banners in different sizes that should meet your requirement. Spread the word across the internet! 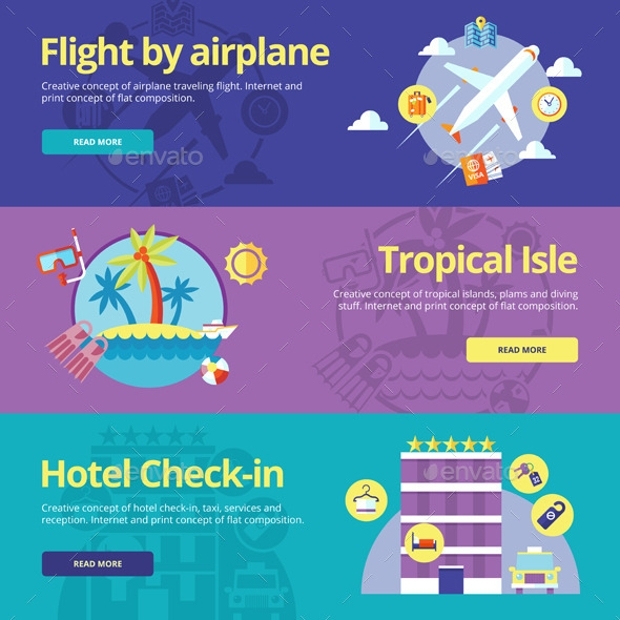 A set of very colorful vectors catering to the travel industry, these web banners can save you a lot of time and money in reaching out effectively to the audience out there. Just put in the relevant text and you are good to go. 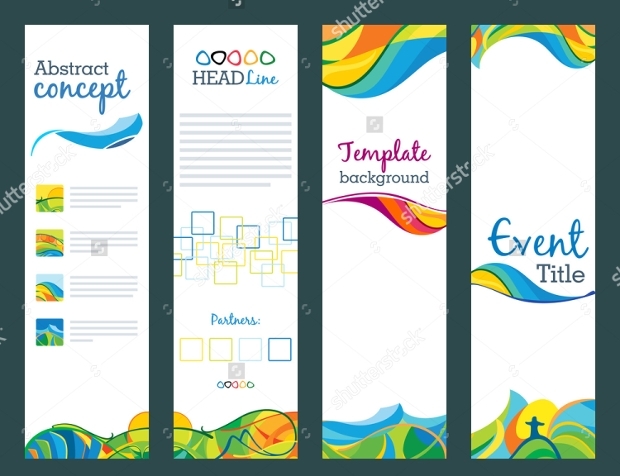 We hope that you have found the perfect banner designs to advertise your products and services. Do leave a feedback on what your think of this collection.